Then you go to the upper right corner of the page where it says, "Sign up for our e-mail newsletter" and type in your e-mail address. You will receive a conformation email and then you can look forward to your weekly newsletter every Thursday! I get excited when I see Mrs. Lorrie Flem's name in my e-mail menu! I know that something wonderful and inspiring is about to take place! Lorrie usually opens with an article of encouragement not much more than 3 or 4 paragraphs. It is a quick and easy read perfect for any busy mom's schedule. Her words of wisdom on marriage, parenting, homemaking, and just being a woman never fail to lift my spirits and give me something to consider and aspire towards. 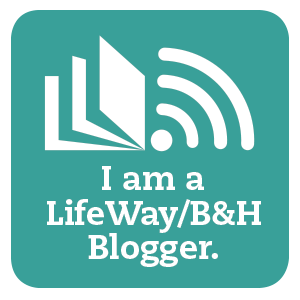 Updates on speaking engagements, sales, and links to other helpful Eternal Encouragement resources are easy to view and not overly cluttered like many e-newsletters. My favorite part is Chick Flicks. I like to think of it as 2 minutes with Lorrie! These are short videos of Lorrie with more encouragement for our hearts. In her usual sweet and soft speaking style she delivers sage advice and often scriptural object lessons to inspire us in our walk with Christ. Doesn't that web page just look like fun? Each week also contains a guest article on a topic pertinent to homemakers. 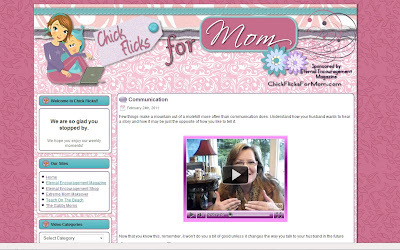 Tips, insight, and wisdom on any topic you might find in the world of moms is covered at one time or another. It just seems impossible to give anything but a positive review to Eternal Encouragement and their products. 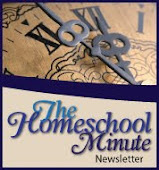 In the life of a stay-at-home, homeschooling mom... I can never get enough encouragement and inspiration to keep motivated through each day! I pray you find moments of encouragement today and every day! Cool idea how you put pics of the newsletter on your computer! I like the picture too! Nice review! Thanks guys! I like breaking up a blog with pictures whenever possible... makes it more readable and more fun :-) Thanks for taking the time to check it out! Girl- I need to teach you how to take screen shots on your computer! haha! But in all honesty, I thought your computer pics were very cute! You have a knack for taking generic review information and somehow coming at it from a different angle. Another great job this month!